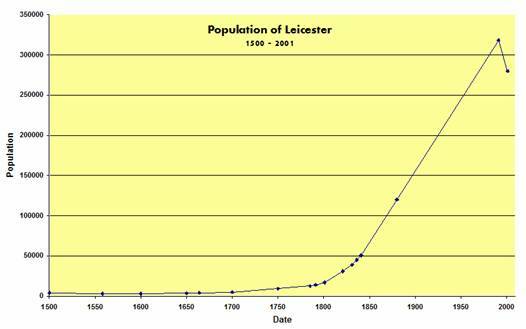 In the last 5000 years, the population of Leicester has grown from 5,000 to around 300,000. In this article, I am going to look at how (and when) this growth took place, and what caused it. 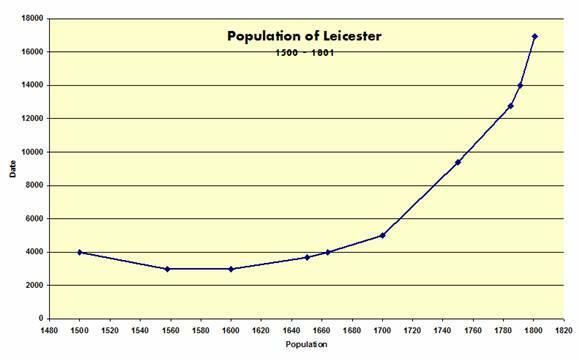 This graph shows the general growth of the population of Leicester between 1500 and 2001. We can clearly see that most of the population growth occurred between 1800 and 1991. This is due to the Industrial Revolution causing a growth in Leicester’s industry (especially the hosiery industry) during the 19th and early 20th century. People moved into the city as more and more jobs were created. Surprisingly, there is a drop in population between 1991 and 2001. This is partly due to people moving to the suburbs from the city itself, and partly due to resizing of the area classed as Leicester City in the census. We can see from this graph that the population actually decreased between 1500 and 1558. There is no known reason for this as yet. It might have been resizing of the city area, or a plague. However, a drop in population of around 1000 occurred if records are correct. After 1558, population steadily increased, with the rate of increase gradually getting greater and greater as we reach the early stages of the Industrial Revolution.